The main problem about Bank Holidays for me is they put my body clock all out of sync. Is it Saturday or Sunday or even Monday? Lucky as Arsenal is the barometer for me of what day it is, I know today is Saturday - it is also St George's Day, so enjoy it fellow Englishmen and women - and we're playing Bolton tomorrow on Sunday. It meant that Arsene Wenger faced the press at just before 9.30am yesterday, to allow his band of stalking journalists the chance to spend the rest of the day in the sun after filing their copy/reports. This press conferences produced arguably one of the best lines ever used by out manager in front of the media. It's right up their with "every man thinks they've the prettiest wife at home".. 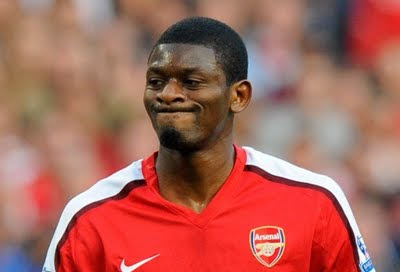 The early team news is that Abou Diaby picked up a calf strain and will miss the trip to the north west tomorrow and is a major doubt for the visit of Manchester United to the Grove a week Saturday. Obviously it's a major blow for the Frenchman who has yet to start more than three consecutive Premier League games all season (thanks @OptaJean). In the previous two games he's played in I thought he was much improved. For me he is the most frustrating player in this Arsenal team. When he focuses his mind, he's excellent. But all to often, he will slow our game down and be ponderous in possession. What has stood out for me was his work rate in the Liverpool game and the first half against Spurs. He was heavily involved in pushing the team forward and making sure our momentum going forward wasn't lost. And whilst I can forgive him for being injured, mainly down to complications with his ankle after it was horrifically smashed up by Dan Smith - then of Sunderland (but where now? ), what I can't forgive is his complete disregard for the team when he fails to track back or for getting booked unnecessarily. He should never give less than 100% - but often he will. I suspect Jack Wilshere will come straight back into the midfield following his first half breather against Spurs. I imagine he'll want to play against the side he was on loan at last season. The main talking point out of the press conference was regarding the money Arsenal might or might not be spending in the summer. Arsene Wenger will never give names to the media about which players he's looking to ship out or bring in. It's not his way of doing things. But he will have been evaluating where he wants to make changes to his squad and which players no longer fit in with his plans. I could list you the names of players who have an uncertain summer and it would contain most of the players in the squad one way or another. But it's easy to forget that we have made progress this season and there is still the slightest of chances we can pick up the league title still. Any which way you look at it, Arsene Wenger has never been a manager to make wholesale changes whilst he's been at Arsenal and I can't see him starting now. "You cannot come to a conclusion this team needs a massive change. "It is not as simple as that. What is odd in our world is that everybody is bankrupt but the guy who doesn't spend is an idiot. "The club is in a healthy financial situation and, if needed, we can make a big transfer. Our team has an average of 23 years old. Why should we have a huge turnover at the end of the season?" Personally I don't think there needs to be a massive change. We have the nucleus of a team which is good enough. To my mind we need to add proven quality and experience to that core. I wouldn't expect a handful of players to leave. But who knows? The Daily Mirror have listed: Andrey Arshavin, Denilson, Emmanuel Eboue, Manuel Almunia, Carlos Vela, Abou Diaby, Nicklas Bendtner, Samir Nasri, Cesc Fabregas and Gael Clichy as players who could all leave. The Daily Star say: Cesc Fabregas, Andrey Arshavin, Nicklas Bendtner, Denilson, Tomas Rosicky, Manuel Almunia, Emmanuel Eboue and Gael Clichy could leave. The Daily Mail say: Denilson, Emmanuel Eboue, Gael Clichy and Nicklas Bendtner are all on their way out. At the moment it's all speculation who will and won't go. Personally, I can't see there being a ten player summer exodus. The one person at the club who Arsene Wenger wants to see stay is his assistant Pat Rice. However it is looking increasingly likely the man who has been at the club for decades will retire at the end of the season. "I am looking to tie him down. Persuading him, that is the stumbling block. If we need a change it is certainly not Pat Rice." Whilst there appears to be a clammer for change whether it be on the pitch or within Wenger's back room staff, keeping Arsenal running and moving forward is the most important thing. The one thing we do need to do is stick together. Arsene Wenger has called on us to support the team until the last minute of the season and that's what every true supporter should be doing. Some Saturday reading? The Guardian's Barney Ronay covers in his column the myth that Arsenal need British players to win trophies. Well worth a read. Finally, we've been linked with a move by the Daily Mirror for Roma midfielder Jeremy Menez.